Rediscover the enjoyment of swimming. Not been in the pool for a while? It's time to rediscover swimming, wherever you live across Derbyshire. It's a great way to keep in shape. You'll enjoy this fun activity for the whole family. Knowing how to swim is a skill for life. Water safety can help save lives. It's great for pregnant women or people with disabilities to keep fit. And remember swimming can be so much more than lanes. Have you thought about aqua circuits, aqua jog or aqua zumba? Many swimming pools also offer family splash sessions. 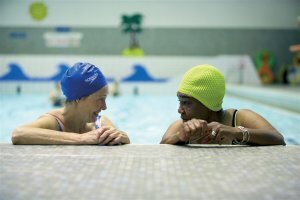 Swimming is a simple way to keep fit, to relax and to socialise. It's a great way to bond as a family and the rhythmic action is calming and helps get rid of stress. Know what you are looking for? Why not use Pool Finder to find out what is going on at your local pool and start making a splash. Watch this video that describes the benefits of swimming. Did you know that even a gentle swim can burn over 200 Kcal in half an hour and a fast front crawl can burn as many calories as an 8mph run? Swimming is a lifelong skill that could save a life. If you can't swim, it's never too late to learn.